Parking lot seals can go a long way to preserving the long-term integrity of your parking lot. The top layer of this material will defend asphalt against erosion, while the procedure as a whole protects against water and UV rays. You can reach us at 254-716-8685 anytime you'd like to talk about our services for parking lot sealing in Waco and Temple, TX. Parking lot sealing, like most other industrial sealing, offers multiple benefits like substantial protection against the elements and erosion while keeping your parking lot neat and uniform for a professional appearance. Our experts can explain all of your parking lot sealing benefits in Waco and Temple, TX, as well as the right choice for you. 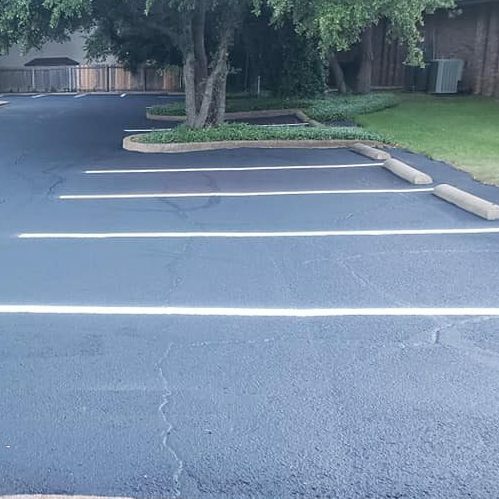 An asphalt sealing can not only protect your parking lot from UV rays and water damage, but it can also offer substantial resistance to traffic-related deterioration and degeneration caused by turning wheels and hard stops. Sealings are easily applied by professionals and can help you parking lot last years longer with fewer repairs. When your parking lot was first applied, it was dark, uniform, and neat. Today, it has turned gray and is losing its gravel. Restore the vibrancy of your parking lot with a sealing. Not only can parking lot seals protect, but they offer a complete restoration of color, feel, and elasticity. As your parking lot is driven on, the gravel and tar are worn down and taken away a little bit at a time producing an extremely smooth driving surface that can be very slippery and hazardous, especially in wet conditions. A parking lot seal will eliminate wear of the material and revive your parking lot’s traction for safer interaction between patrons. In Waco and Temple, TX, parking lot sealing can have multiple benefits for your business, employees, and patrons. Don’t let a worn, drab parking lot turn off your customers. When you need a professional application of your sealer, call our experts at 254-716-8685 for a job well-done every time. Updated on March 19, 2019 at 4:05 pm by eSquared Asphalt Maintenance.